See the BBQ book HERE ! 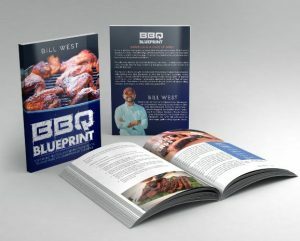 The BBQ Blueprint is now out! Have you always wanted to bring home the blue ribbon in your local BBQ cook-off? Or maybe you’re just curious to hear what the best pit masters in America do to create succulent feasts for the masses! In this book we’ll help you to hone your barbecue fundamentals, master the grill, and discover secret recipes you’ll return to for a lifetime. BBQ is all about Low & Slow. However, there are time savers, tricks, secrets, and shortcuts. See inside the book HERE ! Somehow we got so wrapped up in the popularity of competition barbecue that no one shares anything off their plate anymore. This book is all about sharing. Do you want to see behind the scenes at the worlds most popular BBQ pits? Anthony Bourdain visited Scotts BBQ and now you can too. From the underground charcoal roasting bow tied servers at Charlie Vergos’ Rendezvous in Memphis to Lockhart’s in Texas, we go behind the scenes and show you what the best of the best do with ‘Cue. We reveal the essential Pitmasters recipes and techniques most used by both backyarders and competition teams. Sometimes the secret is more in the technique than the ingredients (like getting bite through chicken skin). Plus, you’ll get access to our exclusive downloadable cook’s log for home and competition along with an additional free downloadable pro competition gear checklist. Grab the digital or print (in color and now black and white interior).